Sami al-Arian is a former faculty member at the University of South Florida. He pled guilty in 2006 of raising funds for the Palestinian Islamic Jihad, a terrorist organization, after being charged in 2003 with numerous terrorism-related offenses. The case dragged on for almost three years, and the jury was unable to decide on a verdict on most of the charges. As a result of his plea he was sentenced to a little more than time served, and was ordered to be deported. Just to give you an idea of the kind of guy he is, here is a 12-second video in which al-Arian calls for “Victory to Islam, Death to Israel“; and here is another in which he calls upon his listeners to “Damn America and Israel to Death“. His supporters insisted that the prosecution was ‘political’ and an attack on his right of free speech. But the government insisted that al-Arian gave material support to an organization that he knew was committing terrorist acts (and among whose hundreds of victims were two Americans, killed in Islamic Jihad suicide bombings in Israel). Al-Arian was also sentenced to 14 months for civil contempt, because he refused to testify against former associates. This sentence was canceled by another judge — but he has been subpoenaed again to testify in front of a grand jury, presumably to be asked again about individuals thought to be involved in terrorism, here and overseas. He has refused to comply and is presently on a hunger strike. Because the College Community Congregational Church here in Fresno will shortly be presenting a film and discussion about al-Arian. The film, “USA vs. Al-Arian” is entirely one-sided, focusing on the “heart-wrenching traumas” suffered by al-Arian’s family, and claims that it is his “fight for Palestinian recognition that garners the attention of the authorities” and not the fact that he raised hundreds of thousands millions of dollars to pay for the murder of Jewish Israelis and Americans whom he likens to the sons of monkeys and pigs. The discussion will be led by Melva Underbakke, a former co-worker of al-Arian, who organized a group called “Friends of Human Rights” in response to his prosecution. 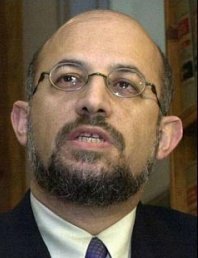 Did Sami al-Arian know that the Palestinian Islamic Jihad for which he was raising funds was actually a terrorist organization which has killed hundreds of innocent Israeli civilians by suicide bombings, shootings, and rockets? “There is real reason to be concerned,” [pollster Khalil] Shikaki said in an interview at his West Bank office. His Palestinian Center for Policy and Survey Research, which conducts a survey every three months, is widely viewed as among the few independent and reliable gauges of Palestinian public opinion. His explanation for the shift, one widely reflected in the Palestinian media, is that recent actions by Israel, especially attacks on Gaza that killed nearly 130 people, an undercover operation in Bethlehem that killed four militants and the announced expansion of several West Bank settlements [building within existing ‘settlements’ near Jerusalem that are expected to be retained by Israel in a final agreement — ed. ], have led to despair and rage among average Palestinians who thirst for revenge. How did it get to this point? Why has it been impossible for Jews and Arabs to reach an accommodation in the region? Palestinians never accepted the presence of the Jewish state, and always believed that the land on which it was built was stolen from them. They never accepted any of the responsibility for the events of 1948 and thereafter. The Arab nations and media always presented this distorted view of historical events, and Arab and Palestinian leaders — the Mufti, Arafat, Nasser, etc. — consistently rejected any attempts to make peace or solve the refugee problem. According to the Palestinian story, they are entirely the victims, and everything is the Jews’ fault. Therefore there is no reason to compromise, since real justice would require the elimination of Israel and the removal of the Jews from their land. Over the years, under the guidance of such as Arafat, Palestinians tried to achieve their goals by murder and terrorism. Israeli attempts at self-defense have always been interpreted as aggression, both for external consumption — to create sympathy for the Palestinians in the West — and in their own minds. After all, since the Jews are entirely culpable for Palestinian suffering, anything may be done to them in order to obtain justice and end the suffering. The Oslo debacle demonstrates this clearly. While Israelis were prepared to make concrete concessions and to re-educate themselves to the new reality of a Palestinian state, Arafat was not prepared to give anything — not recognition of Israel, not a cessation of terrorism, and, probably most significant for today’s situation, not a reduction in anti-Israel incitement. In fact, Arafat created a massive indoctrination machine which included all Palestinian media, the educational system, PA-associated mosques, etc., all focused on delegitimizing and demonizing Israel, and preparing young Palestinians for their roles as soldiers in the coming war. The truly remarkable thing about this period was the way that Israel and the US managed to ignore all this, to ignore Arafat calling for jihad in Arabic while talking peace in English, to discount his sponsorship of terrorism — even after it was proven beyond a doubt — and to offer him an unprecedented deal in 2000 in which the Palestinians would receive between 95 and 97 percent of the West Bank and all of Gaza for their state. But anyone who knew the Palestinian story could have predicted that Arafat would reject even this, because it did not redress the primary Palestinian grievance, the creation of Israel on ‘their’ land. And in the same way, the Palestinian story implies that anything that Israel does in self-defense — the security barrier, arrests of terrorists, incursions to stop rocket fire — is done to perpetuate the injustice, and will only create more outrage. So here we are, 60 years after 1948 and the Palestinians are furious and want revenge. 60 years have passed, during which time the Palestinians have focussed on themselves and the historic injustice that they understand to have been done them so narcissistically that they are now unable to see that slaughtering innocent teenagers and randomly bombing civilians is evil. We have a situation in which a majority of a population has been turned — by systematic manipulation and indoctrination — into moral monsters. The US is transferring $150 million in aid to the Palestinian government in coming days, the Palestinian Prime Minister announced Wednesday. The payment is part of a total of $550 million the US pledged to pay to the Palestinians over three years, part of a total of $7.7 billion in pledges from international donors made at a conference in Paris in December. [Palestinian Authority PM Salam] Fayyad said the US money would go directly to the national treasury, to be used for running the cash-strapped government. Everybody knows that the Palestinian Authority (PA) under Mahmoud Abbas and Fayyad does not represent a significant number of Palestinians, is not capable of making a peace deal with Israel that both sides could accept, and could not enforce such a deal if it were made. Everybody knows that the only thing keeping the PA from losing control of the West Bank as happened in Gaza is the presence of the IDF. Abbas’ frustration at the failure to make progress in talks that are supposed to lead to an independent Palestinian state is disingenuous: he knows that Israel cannot accept a right of return for refugee descendants, and he knows that Palestinians will not recognize Israel as a Jewish state. Israeli PM Olmert’s pretense at negotiating with Abbas is just that, because he knows the same things. President Bush knows that “a peace agreement between Israelis and Palestinians that defines a Palestinian state” will not be signed this year, at least not a meaningful one. Everybody knows that Hamas is more popular among Palestinians than any other political entity. Everybody knows, even Javier Solana of the EU must know by now, that Hamas is committed to destroying Israel, not ‘liberating the Palestinians’ from the 1967 occupation. And everybody knows that Hamas is funded by Iran, which is also committed to same goal. And everybody knows that establishing a peaceful Palestinian state — especially one which is “viable, contiguous, sovereign, and independent” in President Bush’s words — while Hamas controls Gaza and threatens to take over the West Bank — is simply impossible. So why are millions, indeed billions, earmarked for this project, when everyone knows it is entirely a charade? Why do we continue to hear the same nonsense from politicians and media about the importance of the Israeli-Palestinian conflict, when the greatest problem — the problem that threatens to engulf the world in nuclear war — is the struggle between Iran and its allies and proxies and the West for control of the Middle East and its resources? Why is less attention paid to the nuclear weapons presently in the hands of the highly unstable Pakistan and those soon to be built by Iran than to the importance of a ‘contiguous’ Palestinian state? Maybe I need to change the station on my clock radio. Israeli officials insist the wall and checkpoints are needed to stop Palestinian attacks inside Israel. NPR has been criticized for their biased coverage on numerous occasions, and they say that although one piece may present a particular point of view, there will be others expressing the other side. So I said to myself “they owe us one”. Today I got what they probably consider the Israeli point of view: “Israelis, Government Divided on Dealing with Hamas“. Big surprise, the four minute segment is almost all Israelis who want to talk to Hamas. Perhaps 30 seconds is given to a government spokesman who claims that the government is opposed to such negotiations — except indirect talks about the release of kidnapped soldier Gilad Shalit, held by Hamas for over a year — and one woman who doesn’t trust Hamas. NPR mentions a recent poll in which “two thirds of Israelis favored direct talks with Hamas“, but failed to explain that the question asked referred to talks intended to bring about the release of Shalit! So actually the government is in agreement with popular opinion on this issue. Then they bring on Shlomo Brom, a former general who is far to the Left in Israeli politics, calling for a cease-fire, opening the crossings between Israel and Gaza, and for Israel to ‘supply the needs’ of Gaza’s population. The impression is given that this position — which is held by only a tiny minority of Israelis — is actually popular, as opposed to the hard-line stance of the government. But of course this is not so. The reasons to not hold direct talks with Hamas and especially not to negotiate a cease-fire are simple. For one, Hamas is dedicated to the destruction of Israel. It’s not possible to reach an accommodation with someone whose goal and bottom line is wiping you out. There isn’t a middle path between being and non-being. A cease-fire is riddled with problems, paradoxically bringing even more violence. Hamas won’t observe it, letting both its own members and others attack Israel while inciting murder through every institution. The ceasefire won’t last long; Hamas would use it to strengthen its rule and army while demanding a reward for its “moderation”: an end to sanctions and diplomatic isolation; even Western aid. Hamas is not a ‘normal’ political organization, as NPR wishes us to think. Hamas was dedicated to destroying Israel when it was out of power, and continued to be so dedicated after it took control of Gaza. Hamas did its best to murder Israelis when Gaza was under occupation, and continues to do its best now that Israel has completely withdrawn. When Hamas could have had international recognition (and aid) simply by agreeing to recognize Israel, renounce violence and accept prior agreements between Israel and the Palestinian Authority, they refused. There are multiple reasons for Iranian policy towards Israel, which include religious motives, the desire to earn propaganda points in the wider Arab and Muslim world, and their understanding that Israel is a base for American power in the Mideast which must be neutralized in order to expel Western influence from the region. Naturally, NPR and Shlomo Brom don’t mention the Iranian context at all. Soccer Dad points out that there is a new poll in which only 25% of Israelis and just 17% of Israeli Jews want to talk to Hamas. Why the difference from the Ha’aretz poll? Read his explanation here. The US ambassador to Israel, Richard Jones, who once announced that Jonathan Pollard was lucky not to have been executed, has done it again. Jones apparently believes that all areas which were not part of Israel between 1948 and 1967 belong to the Palestinians. This contradicts UN resolution 242 (as interpreted by those who wrote it), the view of the Israeli government, and President Bush’s letter to PM Sharon of April 2004. All of these agree that borders will be decided by negotiations between the parties concerned, and will not necessarily be identical with the pre-1967 cease-fire lines. Unfortunately, the idea that all of the territory that changed hands in 1967 is ‘Palestinian land’ is constantly repeated in anti-Israel circles and apparently this includes the US State Department. Jones also seems to think that Israel is a banana republic whose policies can be micromanaged by the US. 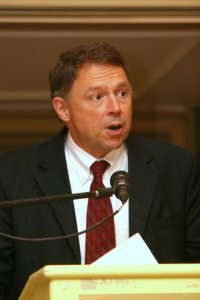 Possibly Jones learned his skills as an assistant to Paul Bremer in the Coalition Provisional Authority, where many of the decisions were taken that resulted in the unhappy situation of the US today in Iraq. Or, when as Ambassador to Kuwait, he was alleged to have intervened on behalf of a Kuwaiti gasoline supplier which overcharged the US military $61 million. I can agree with Jones on one point: sometimes people do have to move. Take, for example, the US embassy in Tel Aviv.